High Winds or Tornado - DO NOT STAY in your camper or RV. Seek shelter in reinforced structures to withstand high winds. Low lying areas may work as a last alternative. We now have an approved shelter located at 1720 Old Hwy 40, (Champions Car & Truck Wash Equipment Room) at Champions Car Wash will be opened up in any case where the sirens are sounding. 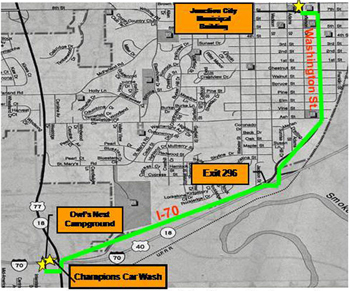 The nearest public shelter is at the Junction City Office Building at 7th Street and Jefferson. *Please have a plan for yourself ahead of time. Listen to AM 1420 for local information.